1100 Bergen Community Garden, saved from the tax lien sale when neighbors raised the funds to pay the debt that, they say, the city improperly assessed. Other properties remain at risk. In 2003, a small not-for-profit organization in Weeksville failed to respond to a $3,200 tax bill from the New York City Department of Finance. The organization could have asked for the debt to be forgiven; it qualified for a tax abatement since the property was being used for a community purpose. 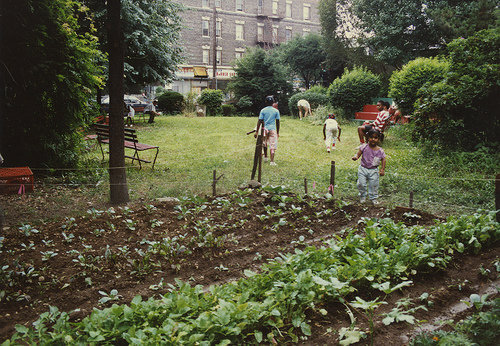 The property is a lot in the middle of the Imani Community Garden, and by 2003, the directors of the organization that had gotten the land donated and created the garden had passed away or moved on. There was no one to respond to the notice, no one to fill out the annual renewal of the city’s tax abatement. In 2004, the Department of Finance sold the right to collect the unpaid bill to a tax-lien trust. The trust initiated foreclosure and, by the time the case was concluded in 2015, the debt had grown to $165,000; by statute the trust had added 18 percent interest compounded daily it is allowed by law, plus fees. After the foreclosure was decided—no one represented the not-for-profit—the trust sent it to public auction, where it was sold for $365,000 to an unrestricted buyer, who quickly sold it for $500,000. The garden is ravaged. A fence divides the 80-year-old willow tree from garden plots on each side, a direct consequence of the City of New York’s illegal sale of the debt that should have never been owed. It looks like condos are on the horizon. It’s a tough one to explain to the gardeners, who have been caring for the space diligently for decades since it was created by Parishioners of Our Lady of Charity, the first black Catholic congregation in the diocese, in 1974. Something has gone terribly wrong. And each May for the last twenty years, the City of New York repeats the mistake that leads to hundreds of Imani’s across the boroughs. Each year, New York City sells between $70 and $120 million in unpaid tax debt, water charges, and emergency repair loans owed to it to a private trust in the Department of Finance tax-lien sale. This sale includes the right to collect bills owed by homeowners who simply cannot afford to pay on time. It also includes debt against properties owned by charitable organizations that act as key community hubs—daycares, gardens, churches—that are, under the New York State Constitution, entitled to remain exempt from property taxes. And it includes debt against a couple thousand vacant and abandoned properties with no owner to hold accountable. By selling the right to collect the unpaid tax bills, the city gives up the leverage has to help keep low income homeowners in their homes, to protect places important to our communities and to transform abandoned and neglected lots and houses into new gardens, parks, schools and affordable housing. The sale is scheduled for this Thursday. It will shift the burden of keeping life-sustaining institutions in our neighborhoods from the public realm into private negotiations between homeowners and non-profit organization’s boards. Where owners are absentee or the former leaders have passed away, this conversation will be one-sided: once the tax-lien trust has purchased a debt against a property, it can and eventually will foreclose. $3,200 in tax arrears to the city will be transformed into a property worth $500,000 or more. For the investors, it’s a great deal. But for New Yorkers, it is the transformation of our neighborhoods into nothing but commodities. As a city aspiring to heal its divisions, we should remove all vacant and abandoned lots and properties owned by charity institutions from the sale in order to protect community services and help communities create the resources they need. Our future depends on it. It’s been the city’s practice for two decades to sell property-tax debts to a private trust, generating revenue for the city and for investors—but, advocates say, hurting low-income homeowners. For months volunteers at dozens of community gardens have wondered which ones might be targeted for affordable housing. Our partners at Brooklyn Deep were in the room when gardeners learned the fate of their neighborhood plots.